for about a year, I've been posting entries from my Drag Shop Diary in an Off Topic Group (Tavern) in a thread called Whatchadoingtoday. I've decided to instead start to post in the Race Channel, as it all has to do with the goin-ons of my race shop. Below is my first entry on this thread. Wednesdays are Thrash Days as I pay an engineer friend to come and help me. Last week we installed my spare race trans in the Vitamin C. That car is the most difficult of my cars to R&R the transmission, because of the 2.25 headers capturing it. Anyway, my new driveshaft came in (I have a slight score around the old one and thought it wise to not use it) - so it was put in and the trans filled with Type F.
However once the car was was started, trans oil poured out of the front of it. So the spare came out, and the Red one (originally from the Whale), which just had the bent output shaft and broken tailshaft housing replaced, was put in. However the new driveshaft's yoke would only go halfway in the transmission. It was tested on the spare trans that just came out, and the bent output shaft, and it fit them fine - so we knew it wasn't the driveshaft. My bud removed the tailshaft housing (while still in the car) to see if splines were twisted, and found a bur just past the splines and ground it off. By then we were ten hours into the trans issues and decided to finish up next week. I had to install a trailer brake controller in my new Coach. Entegra advertised it was pre-wired for brake controller. I searched the Internet and couldn't find anything about it, so I called support at Entegra. Got a guy who sounded very ifish on the topic. I asked for a schematic and he said one didn't exist. He said to pull the dash panel where the stereo/nav system was and there would be four wires that Spartan Chassis had clearly marked when they'd built the Chassis. For the life of me I don't know why Entegra doesn't just wire in a Prodigy P3 to make life easier! So I did that and there was a spaghetti bowl of wires including a half dozen RCA connections and two sets of four wires NOT clearly marked. With a 9v battery plugged onto the trailer connector, none of the wires came up with 9v with an e meter. Again I searched the Internet and found nothing. So I get to thinking that the center of the dash is a stupid place to have that wire as the only place to mount in a motorhome is on left side - so I pull far left panel where the leveling jacks are. Couldn't find the wires there either. I called Entegra back, and get a different guy. I explain that I have two hours into this, that I'm not stupid, but they need to roll me a bone. He looks it up and says that it is in the dash, accessed from Navigation and climate control panel, and the wires are Red, Black, Blue and White. He said he was looking a photo of it, and I asked him to email it to me. Sure enough the photo shows the wires and I start looking where in the photo it shows they're located - but still can't find. I'm staring at the photo and on the bottom edge I see a small piece of the backside of a gauge - so I pull that panel and find the four wires, which were marked. I weaved them back over to the left side of the floor, where I intended to mount the controller. I couldn't tell if there was any fuse in the line, so I wired a 30amp on the power to brakes and a 15amp on brake light just for safety. There was no bottom edge of dash to screw controller onto, and the controller has to be mounted straight and in direction of travel for the gyro to sense deacceleration - so I had to fabricate and paint a bracket to mount on left kick panel, and to reinforce the kick panel with a piece of metal glued and screwed. I post this much detail in an effort to help anyone else searching the web on how to wire a trailer brake controller on a Spartan Motorhome Chassis - and save them the time I had wasted. Next up on the bizarre, was changing the oil on my 2014 Ford F150 truck. I bought this 5.0 truck with 11,000 miles for my daughter about six months ago. It is a nicely equipped truck that had been rear ended with 4000 miles. The owned insisted it be totaled so he could get a new one. I have a friend who buys slightly damaged F150s at auction to fix, slightly customize, and resell after he drives for a while. He drove from 4000 to 11000 miles, until his next truck was done. I got a great deal on it because it has a grey (salvage) title. So my youngest daughter drives for about six months and the truck now has 17000 miles on it. She's going off to college in August, so I bought my deceased father in law's 2013 Ford Escape, which is low miles and loaded to the teeth, as shes gonna be on an allowance to pay all of her living expenses while in college. Also in the news of being completed, the generator on my toy hauler is now fixed. Thought it was carburetor, but my bud found it was a valve stuck open when he ran the valves on it. Yesterday I started with painting the Thug's recently rebuilt transmission. I sprayed it with a can of Krylon in Burgundy, waited and hour and hit it with another full can. The car was painted a Burgundy and Silver and I have been painting the transmissions the color of the car to keep track of them. While the paint was drying I had the Shop Rat take a hoe to the Shop's Flower Beds to weed and turn mulch, and I hopped on the Zero Turn and mowed my five acres and the five acres of the 90+ year old lady next door. After Mowing, I painted a rebuilt Street/Strip that was in a green Demon with 451 I owned years ago. My brother now has the Demon and is putting a Modern Hemi and 8-speed into. Finally, I had the Shop Rat detail the 2014 F150 that my youngest daughter was driving. I put her into a nice Crossover to go off to college with.I know it s a Ford, but I needed a half ton for a commuter truck, so I can retire my 13-year-old one ton to towing duties only. I'd prefer a Ram, but I stole this fairly loaded truck and its pretty nice. Crazy 11 hour day at shop. Two transmissions in and out. Both leaked badly from Bellhousing. Swapped in new converter but found out that the common denominator was both had new O Rings I had ordered from Summit with a yellow band on them. It stretched and virtually fell off pump when pump was pulled. At 3pm we saw Trans was still leaking with a new front seal kit installed - after I took for a drive. By 4pm the car was back on jack stands. I did top side work removing left header, top bellhousing bolts, top starter bolt and turning crank; while mechanic/engineer friend removed drive shaft, trans mount, lines, drain and converter bolts. Yardman/shop rat helped him muscle trans out while I chased tools. By 4:30 pump was pulled, another pump seal kit installed and new converter was filled and marked for Flexplate. By 5:30 the trans was back in, headers on, shifter adjusted, off jack stands, trans filled, and I was driving up and back long driveway. Car felt good. The three of us sat in the rain (it had to have been 120 in shop today) and enjoyed a Frosty before looking under car. Still need to go back to other trans to change pump O-Ring. I'm planning to top off fluids today, make a hard hit on the road in front of my shop, tighten headers, check for leaks - and if all is well load up to leave Friday for SHRA race in San Antonio. If all goes well there, I hope to hit the Hot Rod Reunion in Bowling Green the following week. I really need to complete two events to shake off this really long slump I'm in. I'm starting to get paranoid. Also consolidated/bagged/tagged trans parts from two large bins to six smaller (small soft parts, small hard parts, Clutches and spacers, drums and spring ends, bands, and external (speedo gears, mounts, flexplate bolts, U Joints, trans yoke, neutral safety...) parts. The one thing about doing on the floor with two people is one guy can be topside pull driver's header, the top four bellhousing bolts, the top starter bolt and turn the crank while the guy underneath removes the crossmember, cooling lines, bottom starter bolts and torque convertor bolts at same time. A motorcycle jack on wheels is pretty good to muscle trans out and in. If doing it one man, I'd do top first and raise the car for the underside. Saturday was the SHRA race for NSS cars. I loaded up the Vitamin C (back with the 440 motor) Thursday and left Friday at 1pm, waiting at a picnic area halfway to SAR fr Damon, Doug and Dave. We arrived at the track at about 5PM and set up pits. The track went hot at about 7:30PM, but it was mostly street cars and the track was hot and very sloppy. I only got two time trials in - both with no added weight. The first pass the car felt sick and I couldn't get past 5500 RPM. It stalled at the turn off and restarting felt like timing was way off - kicking the starter motor back. I found that the distributor hold down had loosened and timing was at about zero (locked down). Got it timed at about 37 and charged the car up. Went back out for a second hit, but returned back to the pits with the starter not cranking fast enough with a 16v battery. I wasn't sure if it was the starter, timing had slipped again or if the battery going dead on me. Charged it 25 amps for an hour, and it felt better, but still not right. I waited for about 90 minutes in the lane as they had some big freakin street car challenge happening. When I made my pass, it was 7.04 in the 1/8 (that's what SHRA runs) and 11.1 in quarter with a lot of slipping and sliding going on. That's the first full pass I'd made in the Vitamin C in three events without breaking something, and that, to me, was a big accomplishment. It was 11pm, my weather station computer was broke and the track was crap, so I wasn't going to earn anything making another pass - and I put the car away. SHRA is night racing and they don't even start coming in until about 2pm. I got my car out in the morning and checked all of the battery cables. They were tight. I don't currently have a volt gauge in the car, but the battery took a long time to charge - so I'm assuming the battery the night before was never fully charged and I'm betting the 2 mile test drive before putting the car in trailer was the main reason. Once it had 16.9 volts showing on a handheld meter, the car started much better, but I'm still betting the starter is starting to crap out - most likely from too many low timing start kicks. At 5PM we got our first of two qualifying (no Time Trials in SHRA), and it was hot. I declared the 7.05 Index and made my pass without added weight. My shift light isn't working, and I screwed up and short shifted 1st to 2nd by a few hundred RPM. I figured I'd be slow for sure, but my time slip showed a 7.049. Our second Qualifying was at 6:30. Between the couple hundredths I lost on the short shift and the temperature cooling - I guessed 38 pounds should be what I'd need to keep from breaking out. I guessed wrong, and did a 7.046 - which put me eight of ten in qualifying - and pairing me up with Doug Watkins who was number three. He got lane choice and put me in the right lane - which I hadn't run, but drivers were complaining was slower. The 1/8 mile is poorly marked, and frankly I'm both not use to 1/8 mile racing and don't see well at night. I really had no chance to play the stripe, so I figured I needed to just guess on the correct weight and drive it out the back door. It was getting cooler yet, and so I bolted on another 50 pounds. I got lucky and Doug red lit - as he was on his number and I ran a shockingly (to me) slow 7.12. While the temp had dropped, storms were moving in - so humidity sucked and there was a head wind. Again, without a weather station to guide me, I was shooting in the dark. I figured I'd just unbolt the 50#s for my second round against Garry Durham. I ran a great 7.052 but had a horrible .090 light VS Gary's good light. Garry Durham went on to win the Event, against Ronnie Smith, who had won the first two races and had a bounty on his head. After the second round we had a little birthday celebration for Damon. I spent the night at the track and got up early and drove home this morning. 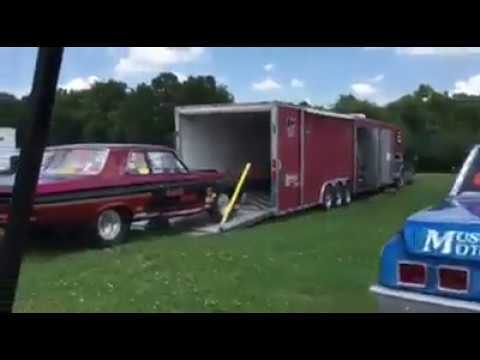 The car ran good, and I'm going to leave in the trailer and take to Bowling Green and the Hot Rod Reunion - but with a spare battery and starter motor. Congrats on not breaking anything!!! Sounds like you did have a good time though. then Home Depot for lumber, paint and roofing to build a shed around the well. My bud that works for me one day a week sealed the front of one race transmission, and rebuilt another. I had him pull the pan and a main cap of an engine Indy built for me - because of early failures five times on other engines they'd built me. This engine only had a dyno pass but the bearing and crank are scuffed bad - as was a cylinder wall that had a new piston up. Pulling the crank scraper off pan and there is a layer of filth and and gold/copper flakes in bottom of pan. Obviously cleaning a machined block is not part of engine building. The whole engine has to come apart to be cleaned, the crank polished and reassembled with new rings and bearings. Words can't explain my disgust from the tens of thousands of dollars lost on early engine failures of their engines. They have to be the absolute worst Mopar engine builder in the world. This is gross negligence. I also mowed five acres while my yardman liquid nailed a hundred or so bricks back up on the shop's facade and planted some Hibiscus, Fire Plant and honeysuckle I bought while at Home Depot. I unloaded the Vitamin C and the golf cart to wash and add a second battery to the car. Shop photos from Thursday and Friday. Painted back up trans that was just rebuilt (since shrink wrapped) and made battery hold downs for the pair of 16v that were in Whale. They were an inch taller the the single 16v I had in car. Replaced a 4ga to cut off with 2 ga and will replace all remaining 4ga with 2 or 3 gauge tomorrow. I spent Tuesday loading up up the Vitamin C and golf cart in the stacker, and the motorhome ready to roll. Showered and ate dinner while waiting for Deb and Hope to arrive. They got there at about 6pm and we left at 7, stopping for 150 gallons of diesel before pulling in a rest area about 150 miles up the road. The point was to not leave in the morning and sit in Houston's rush hour traffic. At the rest hour I was able to see the second half of the Cavaliers getting their asses kicked in the final game of the Championship, and Lebron cry. We were back on the road at 8am Wednesday, and arrived in Bowling Green about 12 hours later. I was told that the track was turning away for the night, so we stayed the night at the Walmart. Thursday morning we arrived at the track, established credentials, set up pi and teched in car. I took the below video. Thursday we got just one Qualifying, without a Time Trial, because of rain. All my car could muster was an 11.06. 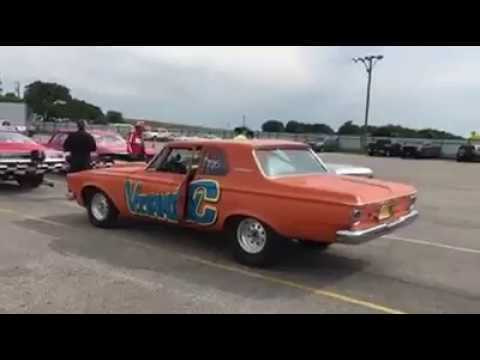 I made this quick video if many of the drag cars there. Friday we again only received one pass, which was the second and final qualifying. Shifting earlier and launching harder bought me a couple hundredths. 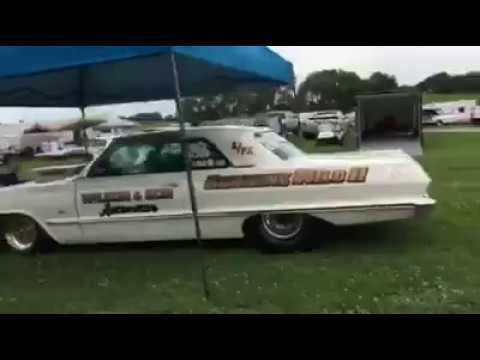 I took the below video of the car show. Saturday, I won the first round by virtue of an opponent Red Light. I had Bruce Samment in the second round. Weather station said my car wouldn't do any better than a 11.05, so I ran it out the back door and took the stripe in a close race. The Weather Station lied, and I got the worst of a double breakout. Doug Duell wound up winning the event. We packed up and left the track at 6pm, driving to a Walmart in Jackson, TN for the night. We left there at 7 the next morning, and arrived at the shop at 7pm. So yesterday I stopped by my middle daughter's house to pick up some wooden planters of Cacti she gave me for my birthday. I placed them with the wash tubs of Prickly Pear I have in front of shop. I then unloaded the golf cart and Vitamin C from stacker, dropped in in front ôf the shop as I have a lot of maintenance and repairs to perform on it, and took the coach to get inspected - so I can register and title. and finally mowed the five acres. with that caught up, I can focus back on cars and trailers a little heavier. Tropical Storm Cindy îs suppose to hit tonight. Good luck with Cindy. I hope the worst she dishes is whatever rain you may need in your area. While at Lowes for Schedule 40 PVC fittings, I picked up a 36"x2" piece of aluminum, a 36" x 3/4" round stock, and a pair of metal 3/8" to 2" mollies to make a strap holder for the rear of my trailer. Yeah, I could order a Pit Pal for $35, but this was half the price and only took 10 minutes to make. I measured off 4" from each end, where I was going to bend, and 2" over and 1" down to drill holes for molly screws. I use liquid window chalk to mark because it wipes off easy. Then to the drill press for a couple 3/8" holes. Also drilled a trio of mounting holes. Say Hello to my little friend at the drill press, who goes wild when metal shavings flies onto his web. I then put in vise to bend for sides at the 4" marks I made. I so need a brake for cleaner bends. Next I used the mollies inside the tube and cranked on them to open up inside the tube. Frankly, threadserts would have worked better, or if I could only weld aluminum. Finally to the grinder to round off the four sharp corners. I mounted with three short and fat self tapping screws, with the center one going into the aluminum stud behind the wall, and hung the straps for rear of car. Next was the transmission that came out of the Vitamin C for a new output shaft - after the old one was bent from U Joint breaking during burnout. I'm guessing this transmission has been torn down and rebuilt with an impact wrench too many times - based on the number of aluminum case threads damaged. Why I didn't have a leak from the drain plug, or even how the plug stayed in, I'll never know. There were 0 threads. I got a 5/8" oversize plug to replace the stripped 9/16 hole, and drilled and tapped for it. Most of the valve body bolts and/or holes were boggered up pretty good, so I chased all of them with a thread repairer. Three of the pan studs just spun in the case as the aluminum threads were on studs and not in the holes. I drilled out, tapped and inserted 5/16" Helicoils. Yeah, there's a impact wrench in photo. I used one to remove the nuts - but a rachet to torque down. Then, washed, degreased, and painted it black. It will go into the Whale after it is torned down and repainted. I'll hit it with another coat on Monday. I have well water at the shop that I have hooked up to a small dual filter and then a small water softener - as the water is very hard and I use it to wash my cars, trailers, and motorhome. The guy I bought the property from just set the well tank on the grass and it has since rusted and leaks. So I bought some Railroad ties, a new tank, some Schedule 40 PVC, and some lumber to fix it all up. My shop rat and I have been spending a couple hours a day for the last week tearing everything out, leveling, moving in the railroad ties as a dry platform, and properly plumbing the tank. I'm plumbing to bring in a bigger filter and water softener for washing cars, and a bypass for a sprinkler system to water flower beds, trees I'll be planting, and a raised vegetable garden I'll be planting this fall. We've got a well shed about half built - about 10-12 hours left for front, door and trim, and shingled roof. It will keep everything cleaner plus insulated to be cooler in the Summer and warmer in the winter.